WooCommerce registration plugin allows you to add extra custom fields to your customer registration form. You can add text area, text box, select box, check box, multi-select box and 5 other types of WordPress registration fields etc. Gather more information from your customers to know about their habbit and needs. The extra information can help you to improve your offering to make more revenue. With a simple drag and drop action, you can add countless number of WooCommerce registration fields to the sign-up form. 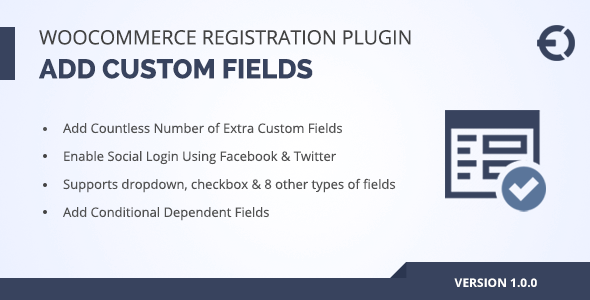 WooCommerce Custom Registration Form plugin requires an easy drag and drop action to manage fields over the sign-up form. To add an option, simply select your required field type from the placeholder and drop it to the adjacent section. In the same manner, if you want to sort different fields within a form, a drag and drop action is required. There is no need to alter the code or design for it. You can add conditional fields to your WordPress Registration form. The extra field(s) will be displayed if the particular condition is met. For example, if some selects he is doctor a secondary field would be displayed to ask his specialization. Install WooCommerce registration fields extension; activate it from ‘plugins’ section, and an additional tab named ‘Registration Fields’ will appear in control panel at the left side. After configuring the settings, navigate to ‘Registration Fields’ where you will find two sections. The section on the left includes all the ten field types, whereas the section on the right is for adding fields to the registration form. Drag a field from the left section and drop it in the right one, configure its settings, and it adds to the form.